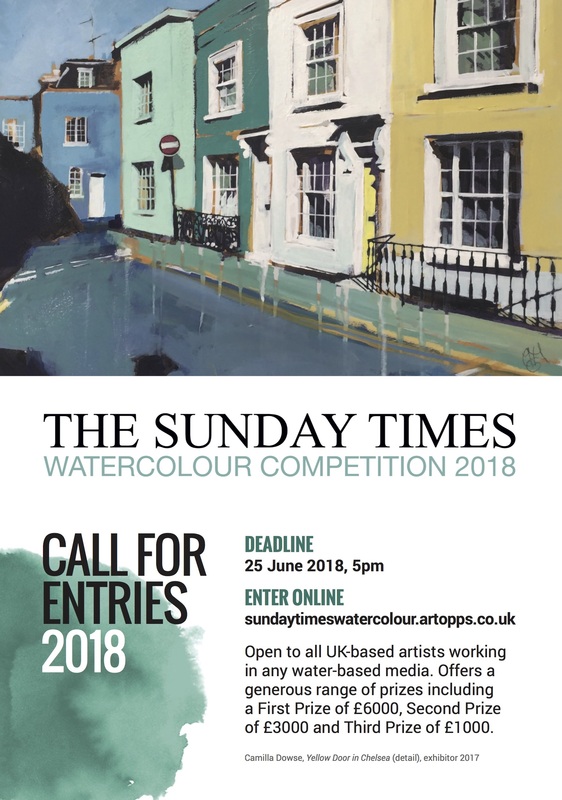 The Sunday Times Watercolour Competition is currently open for submissions! This prestigious and well respected watercolour competition, celebrates the very best in watercolour painting today. From abstract to figurative, contemporary to traditional; there is no house style of the exhibition and every year brings its own surprises. 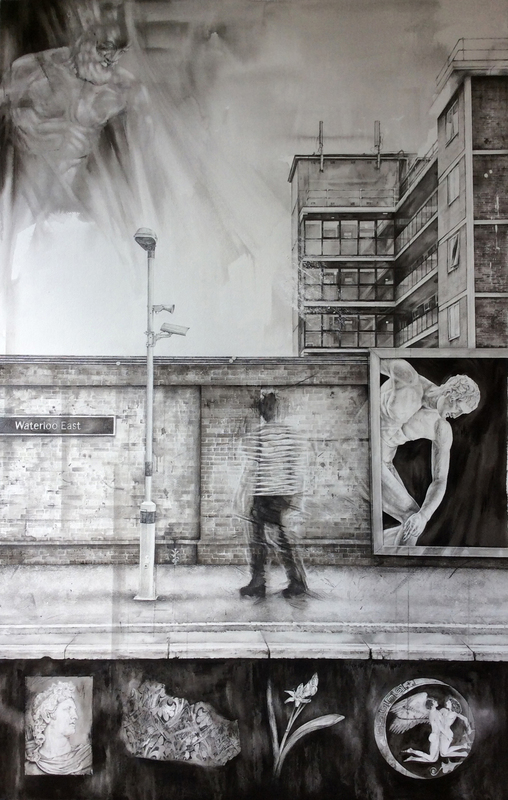 Below is an interview with 2017 exhibitor Claire Sparkes (https://clairesparkes.co.uk/), conducted by Emma Walker of Parker Harris. EW: Tell us a little about ‘Lunch @ Wagamama’. CS: ‘Lunch @ Wagamama’ is watercolour, gouache and black pen. 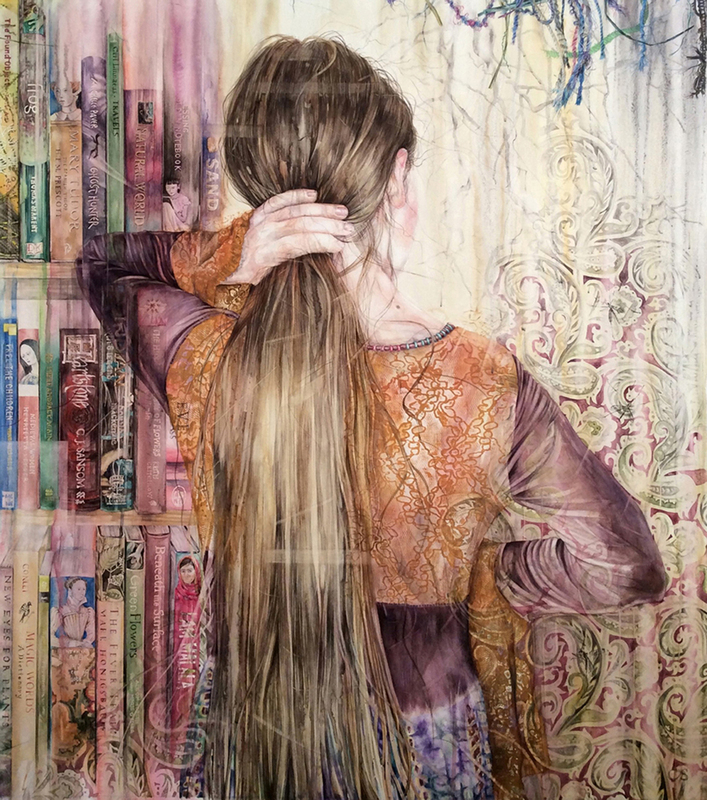 It is a portrait that explores the stark separation between reality and the digital world. 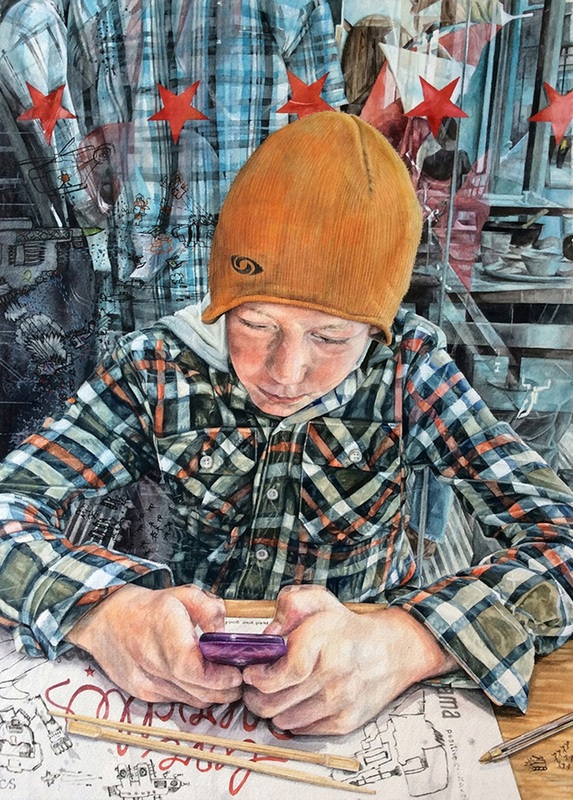 The young boy has found a new reality within the digital world, to which he is almost inextricably connected. His hands, representing his creative power, envelop the device. His eyes no longer look out to his surroundings. The boy is transfixed by the screen. Despite seeming to be enveloped within a digital world, a passionate expression of creativity adorns the placemat. This reveals the capacity of his reality to permeate ours. 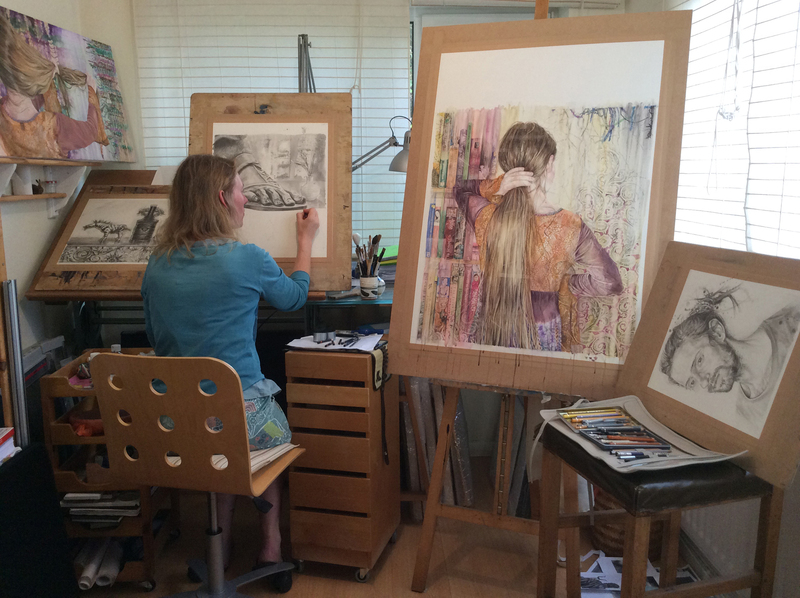 EW: Is there any aspect of your watercolour practice that you’d like to develop going forward? CS: In the past, my watercolour practice included experimentation with looser wet into wet techniques. Now my work is a little more detailed. I would like to develop a combination of those past techniques with hard and soft edges. 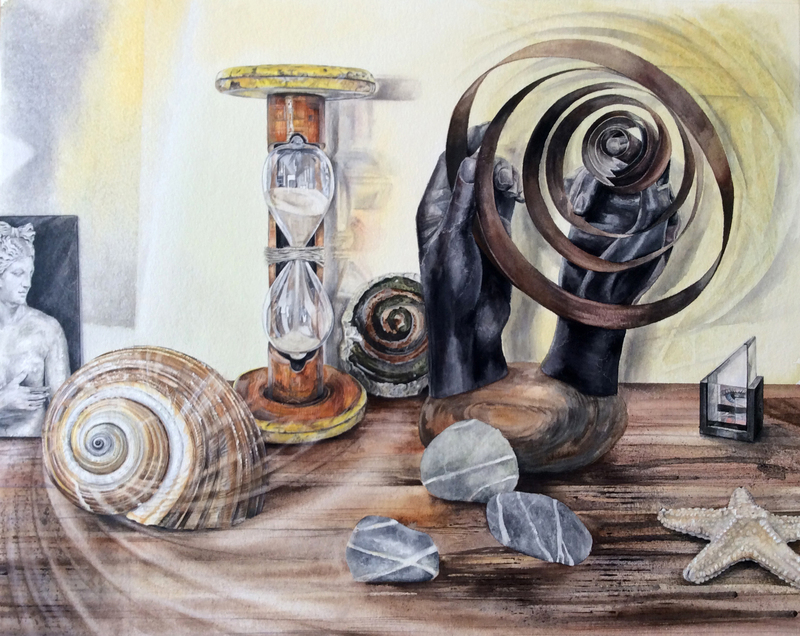 I like to use layers, which have the power to represent mythologies transcending time. EW: What is the most memorable exhibition of watercolour works that you have ever been to see? What was it that made it stick in your memory? CS: In the late 1980’s, on a school trip, I saw an exhibition of Graham Dean’s work in a venue just outside Canterbury in Kent. It made such an impact on me and consequently I still have the catalogue. The scale of the pieces struck me, and the way he illustrated with human condition through his depictions of people. I admired how he employed loose wet into wet techniques, but retained a level of control over the figurative imagery. 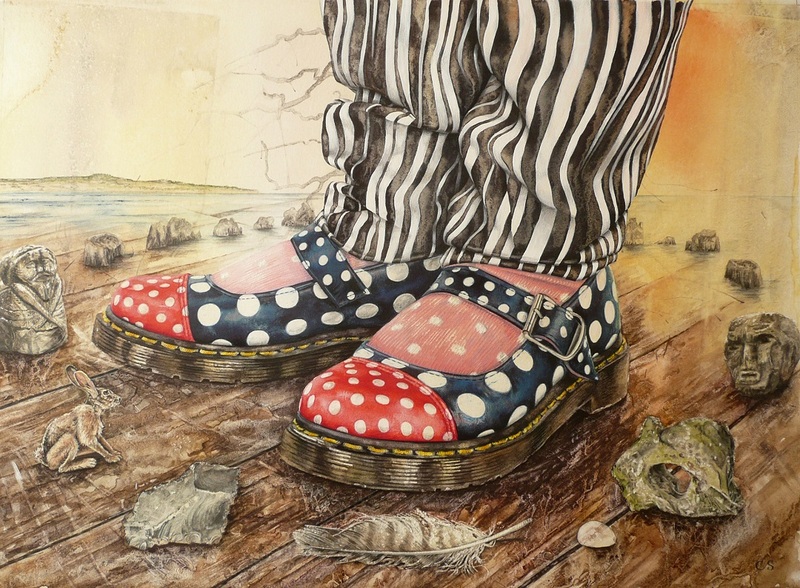 The layering within the paintings allowed him to combine dreamlike suggestions of the past with the everyday. I rediscovered Dean’s work in the mid-90’s in an exhibition in Brighton. I decided to return to watercolour after seeing this exhibition, having painted with acrylics for some years. He inspired me to begin experimenting with a looser style. CS: Flow. Most notably, the way the water carries the paint and flows in its own way carries so much meaning. Essentially, I think it’s magical that although I can guide the medium, I cannot entirely control it. Additionally, I like how colour can be layered and lifted from the surface. It gives me the chance to respond to the behaviour of the paint.